My first day teaching sewing at our local Joann’s went fine. I had two students. Both were continuing students from the previous teacher. First I helped a 10 year old sew the sides to her pj bottoms. She had never seen steam come out of an iron before, so I showed her it can also spray water. She was thrilled. When she brings in the elastic we can finish up the pjs next week and move on to a purse. Purses are a specialty of mine, so it should be fun. My next student is sewing red stitches over the stitches of a pre-quilted pieced of fabric. She is carefully following the already sewn quilt lines, even over the jags and mistakes. She has some learning difficulties, but loves sewing class. During the first student free (unpaid) hour of my shift, I played around organizing the Bali-Pop fabrics for the clothesline bag. It was nice to have a table I didn’t have to clean up first. I kept taking photos and it helped me see the fabrics that stood out and needed to be moved. I want the fabrics to blend a little and form stripes. I think the bag will be more interesting that way. The three lightest ones on the right side I couldn’t find a place for. 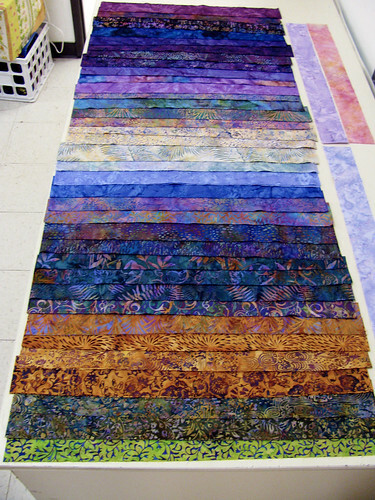 I have several batiks in my stash that will work for the handles and binding. It was rather nice to be in a shop away from home for a change. This entry was posted on Monday, August 3rd, 2009 at 3:00 am and is filed under Sewing. Tagged: Sewing. You can feed this entry. You can leave a response, or trackback from your own site. It sounds like you had a good day! I”m looking forward to seeing your finished bag.